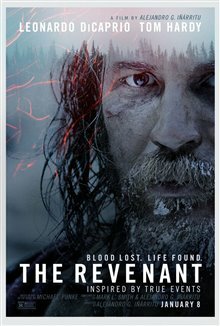 In the 1820s, frontiersman Hugh Glass (Leonardo DiCaprio) is brutally attacked by a bear and left for dead deep in the uncharted American wilderness by members of his own hunting team. Guided by sheer will and the love of his family, Glass navigates a hostile environment, a frigid winter, and unfriendly Native American tribes in his quest to survive. Inspired by true events and based in part on the novel by Michael Punke. 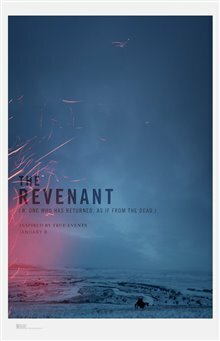 Canadian Connection: Filmed in Alberta and British Columbia. Some cast and crew members are Canadian. 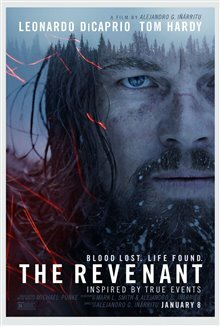 The Revenant featurette - "Themes of The Revenant"
The Revenant movie clip - 'Glass Escapes The Arikara"
"Fantastic scenes, Leo did it very well"
"Another over hyped and underachieved Leonardo Dicaprio film. And unbelievable. I have several in my shelf that I have watched less than half of each one and became bored." "Awesome movie! Brilliantly made and acted. Leonardo definitely deserved the oscar even though through half the movie he grunts during his performance. His portrayal of the character in the conditions of the place and time, and progression of the role made you feel very strongly for a climactic outcome. I did not find it was a slow movie for the length of the film at all."